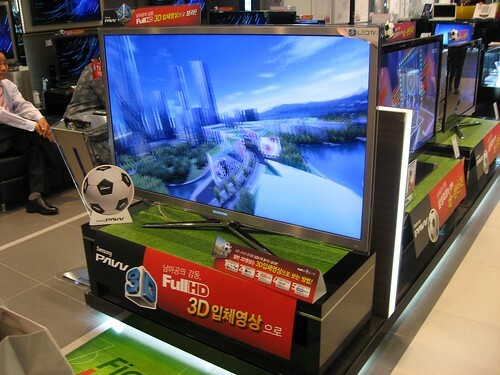 Apparently it was the dream of many Korean men to watch the World Cup on a 3D TV. I thought that was a little optimistic but then I found one in Lotte Department Store near us, proving at least that the technology was really out there as opposed to 'coming soon'. However, at around 2.5 million won (£1,400/$2,100), for many it may have remained a dream for now, although Samsung claim to have sold 26,000 3D TVs in Korea, so evidently some had the money to make the leap of faith. Watching a 3D match live in the cinema seemed much more attainable, but it was so popular we were unable to get tickets. It was remarkable really, considering that at almost any other time football barely seems to register on the Korean sporting radar. I guess that's national pride for you. Despite working full-time during the day, two friends of ours - one of whom never watches football otherwise - arranged their limited sleeping schedule around South Korea's matches and somehow still managed to function at the office the next day. Perhaps unfortunately for the 3D viewers though, some were quite disappointed by the quality of the 3D coverage. What I saw in the Lotte Department Store through 3D glasses was quite impressive, but it was a demonstration video which I'm sure is optimised to sell televisions. As always, real life may vary from the promises we are sold. Even 2D television coverage was problematic. SBS won the exclusive rights to broadcast matches in Korea much to the anger of their competitors, but the practical upshot of this seems to have been that when matches occurred simultaneously SBS only showed one, because they were only using one channel to broadcast coverage. Which meant if you happen to be a foreigner wanting to watch your own team, or a Korean with a particular foreign interest, apparently you were out of luck. The standard line of encouragement to almost anything requiring strenuous effort here is Fighting!, although admittedly due to the linguistic challenge of pronouncing this English word it is often heard as Whiting!, so I hear Korea Fighting! - or Korea Whiting! - rather a lot when the country, or anyone within it, is doing anything remotely competitive. The tag-line for the World Cup though, appeared to be Shouting Korea, or Korea Shouting - a potentially noisy yet welcoming toning down of the rhetoric. When the matches were shown, the highway outside our apartment went eerily quiet - somewhere out there, an entire nation were glued to their 2D and 3D screens. 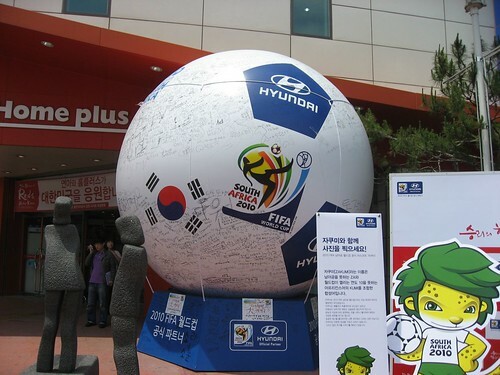 And now it's over - for Korea at least - and presumably an entire nation will go back to the status quo ante as far as football is concerned until the next major championship. I keep meaning to go to a football game here, but they seem so far off the radar normally that I've never managed it, despite having a friend who is a referee with the Korean Football Association. However, there is a reason for the confusion - we don't get SBS Sports on our local cable service. The annoying thing is - we used to when we lived a mile away in another district, but of course, that's another cable company. Since Korea and England have both been knocked out - and there probably aren't any more simultaneous matches - I suppose it's academic now! The same thing happened in Canada. The CBC (Canadian Broadcasting Corp.) bought exclusive rights, meaning that only one match would be broadcast. However, they would still play all matches, one would just have to be a taped match later in the day. Occasionally the French-language station (also owned by CBC) would play the other match simultaneously, but only if a French-speaking nation was playing. Otherwise, they showed the same match as the English station, but with French commentary. A little annoying, but seeing all the matches replayed later in the evening wasn't so bad.